With TC-Data, you create your own interface to send the gestures and touch motions you choose. There are no sliders, knobs, or buttons. TC-Data directly connects your touch movements to the outputs you program. 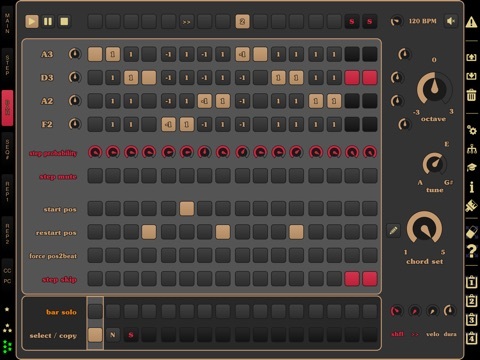 TC-Data is based on TC-11, an all-in-one multi-touch synthesizer. TC-Data takes the multi-touch controllers from TC-11 and opens them up to any external software. Add multi-touch gestural control to your next project with TC-Data. The best MIDI controller is the one that you have with you. Double Decker transforms an ordinary Bluetooth keyboard into a sophisticated MIDI controller, giving you a much bigger playing surface, while still being portable. The app is designed to work with US/English keyboards; the key arrangement for other languages may not be compatible. ** There are a few important limitations to be aware of! We would recommend reading the in-depth review of the app on Music App Blog, which gives a good overview of the features and limitations. On iOS, an app can only receive keystrokes from a QWERTY keyboard when it is in the foreground. For this reason, Double Decker must be in the foreground to work; this is a limitation of iOS, and there is no way that we can work around it. The app is designed to send MIDI notes to other apps (running in the background), or MIDI to apps running in the foreground on other devices. The iOS operating system only makes key press information available to apps, and not key release. For this reason, Double Decker cannot make a QWERTY keyboard operate like a typical (piano) keyboard. Press a key on the Bluetooth keyboard to trigger a note. When you touch another key, the first note is silenced as the next note is played. Tapping the space bar will silence all sounding notes. While it would obviously be better if lifting up on a key silenced a note, iOS does not provide this functionality for app developers. The app features a state-of-the-art Soundfont engine, advanced MIDI routing capability, support for Apollo MIDI over Bluetooth, and even Audiobus! The keys are arranged with the two middle rows in a piano-style formation. Play a second instrument using the bottom row of keys, and two more instruments using the number keys and punctuation. Each key can be configured to trigger either a single note or a chord. A second arrangement of the keyboard divides things into four grids, four-by-four each. This is great for finger drumming, and triggering samples and sequences. Double Decker supports Soundfonts, opening up a world of different tones. The app also has full support for MIDI, giving almost unlimited sonic potential. Using the MIDI Learn feature in apps such as Loopy and Genome, you can start and stop recording, play synthesizers, and switch tracks, all with a Bluetooth keyboard. If you have multiple iOS devices, you can link them together using the low latency connection provided by Apollo MIDI over Bluetooth. Run Double Decker in the foreground on one device to catch keystrokes, and then send MIDI to a second device, which can have a synthesizer or sequencer app in the foreground. * Innovative use of an external keyboard to trigger notes. * Keyboard arranged into two groups, each with four different playing regions. * Each region can be assigned a Soundfont patch, a set of MIDI destinations, or both. * Soundfonts can be added using “open in” or iTunes file sharing. * Each key in each region is configurable as either a note or a chord, with independent velocity control. * Key configurations can be saved as presets, shared through email, or downloaded from the web. * The app supports the Audiobus “input” slot. * Built-in support as a Apollo MIDI over Bluetooth “A” endpoint. 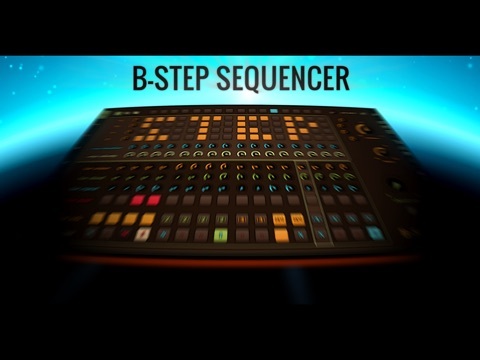 Transform your iPad to a real music-sequencer workstation with B-Step! The sequencer comes with native support for one or two Novation Launchpads. B-Step supports CoreMIDI, Virtual MIDI ports, Network MIDI and a lot of MIDI hardware devices! It also supports MIDI Learn, so you can control B-Step’s user interface with any MIDI controller you like! B-Step Sequencer can work as MIDI clock master or you can sync it to another clock master. With B-Step you program your melodies in a few seconds and you can’t hit a wrong note. This sequencer is designed for improvisation and live use – your synthesizers will love B-Step. – Native Novation Launchpad support. – 4 tracks (we call them strings). – 5 x 6 chords per project. – Support standard MIDI hardware devices. – Track Speed (bpm): choose the speed for each track from a range of 1 to 240 beats per minute. – Track Note Length (%): choose the length of the note for each track. The note length is a percentage of time between beats. You could specify a high note length on a track with a low track speed to get some nice atmospheric held notes. Alternatively you could specify a low note length on a track with a high track speed and get some nice arpeggiator effects! – Track MIDI Channel: choose the MIDI channel for the track. By default these are set from 1 to 16 for each track respectively. – Track Velocity: choose the velocity (or force) that the sequence of notes is played on this track. The higher the velocity, the louder, or more emphasised the resulting sound. Do bear in mind that the app, virtual instrument or hardware synth must respond to velocity in order to hear the effect of this property. An arpeggiator designed for MIDI hardware, iOS instrument apps and DAW environments, Arpist processes MIDI input to generate musical arpeggios and rhythms. Musk MIDI Player: Your instant MIDI player – just add sounds and MIDI files! * Safari: search for a website that offers SoundFonts. Click on the file. Wait until it is downloaded. Then select this app in the “Open In” dialog. * Mail: Select the attachment and select this app in the “Open In” dialog. ** Important ** Apollo is not compatible with the iPad1 and 2, and the iPhone4 and earlier. Please make sure that your device supports Bluetooth LE. The iTunes App store has no way for a developer to specify which devices can support an app, other than an iOS version restriction. In iTunes, the compatibility is listed as “any iPad” — this is not correct, and we have no way to correct it. While the app will install on older devices, they do not support Bluetooth LE, and the app will not function as intended. Before you purchase the app, please make sure that you have one which does support Bluetooth LE (iPad3 and newer, iPhone 4S and newer). Install the app on two iOS devices, select an “A” endpoint for one, and a “B” endpoint for the other. Press the search button on both, and a Bluetooth connection will be established. After connecting, MIDI messages sent to Apollo running on one device will be forwarded to the other — and these messages can then be redirected to synthesizer or sequencer apps. In addition to MIDI connections between iOS devices, Apollo can also be used to connect to Mac desktop and laptop computers. Recent iMacs and MacBooks support Bluetooth LE; for older Macs, a USB Bluetooth adapter may be required. The OSX version of Apollo is available in the Mac app store. 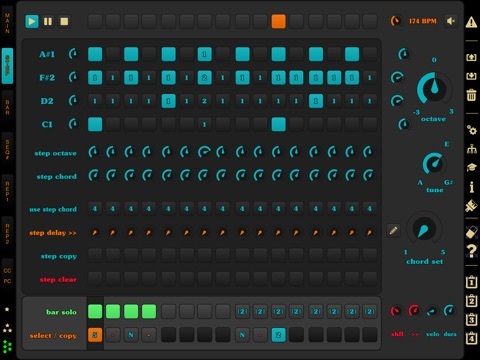 The Spectre Midi Sequencer is a modular sequencing iPad app. The modules used in this app are basic building blocks for generating sequences. The sequences can range from simple to complex in a very intuitive fashion. 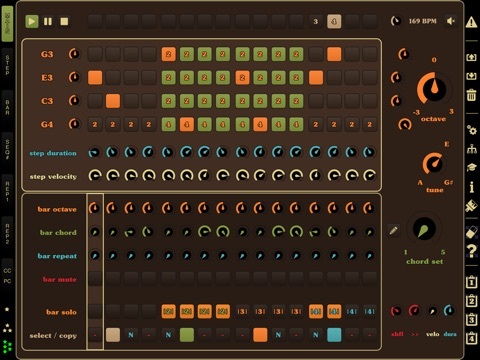 The Spectre Midi Sequencer is a modular sequencing iPad app. 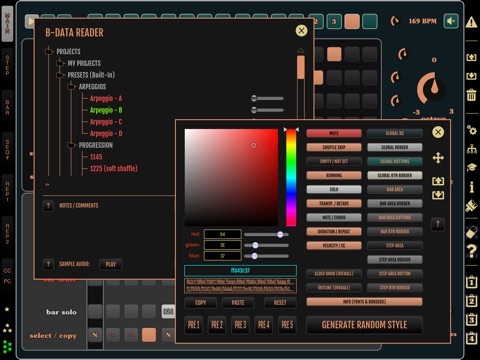 This app is built to emulate the way analog modular synthesizer sequencing systems operate. The modules used in this app are basic building blocks for generating sequences. The sequences can range from simple to complex in a very intuitive fashion. The main feature of this app that allows for creative sequences is the virtual “CV” and “GATE” Features. In this app, CV refers to the pitch or note and GATE refers to the actual triggering of a note. When the CV and GATE are running on patterns independent from each other and are combined at the output, magic happens. The basic components of this app are: 4 sequencers, 2 clock dividers, 2 sequential switches, 2 logic modules and one output module which is used to generate midi notes. I will go into detail on each component, but a Google search may prime you before reading the rest of the manual. Like real modular synthesizers, they are connected with patch cables between components. The cables can be added, removed and arranged in any way you can think of.